My wife's little sister, Kate had a quick visit to the Pacific Northwest from upstate New York. She wanted to see us and visit Pacific Grill, but I'm not in which order her preferenace ran. We were happy to see her, regardless. Joining us were her daughter, Marie from Lynnwood, and Peg's older sister, Pat. I made reservations and asked for Diane to be our waitress. She hadn't waited on us in some time. Once we were seated we were welcomed by our other favorite waitress Danielle. Gordon Naccarato, the chef/owner stopped by to talk to us, also. Gordon has done a marvelous job with Pacific Grill. 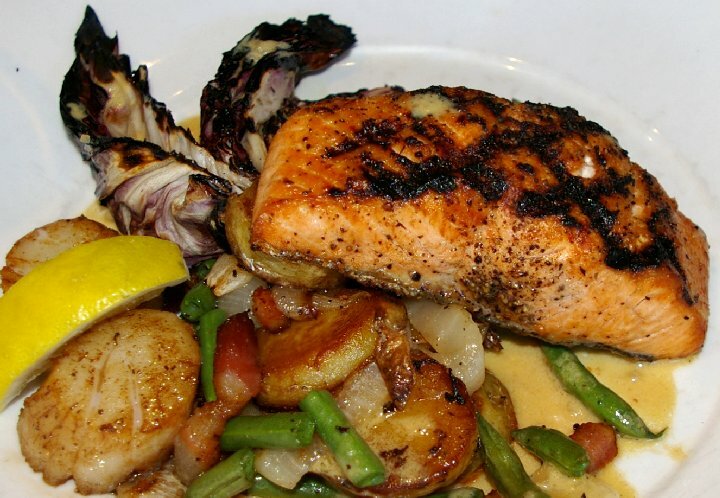 Pacific Grill is our Number one preference for fine dining in the Pacific Northwest. Diane took our drink orders and gave us the new Summer Menu. The menu changes quarterly. 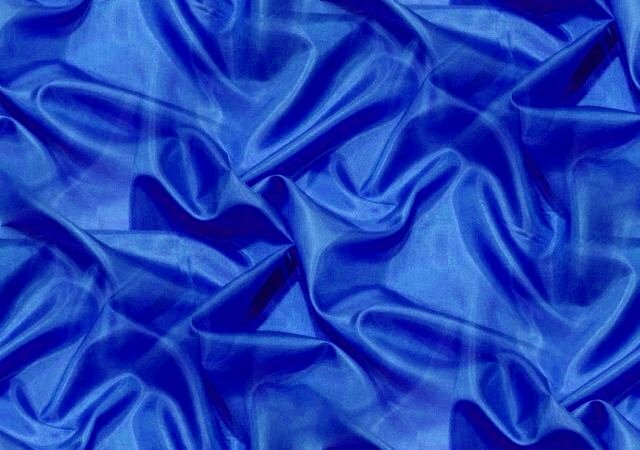 We are always happy when they retain our best-loved selections and provide new offerings as well. 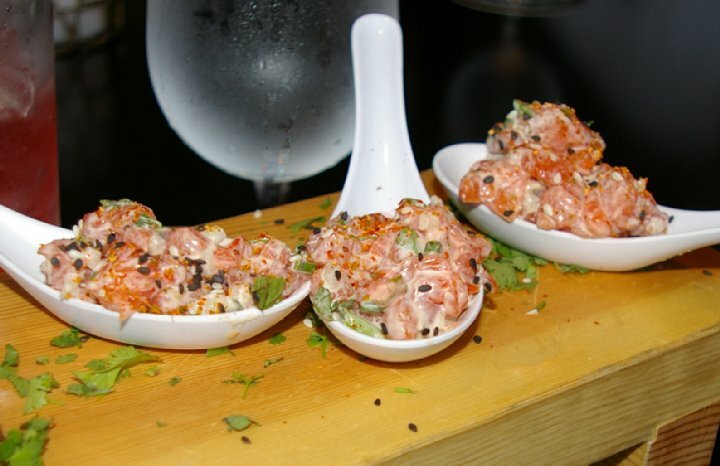 Peg ordered the Poke Salmon Spoons: raw salmon with miso-soy mayo, crispy wontons, bean sprouts, green onions, sesame seeds, togarashi and cilantro. We first sampled poke on Hawaii, the big island, in a little Hilo fish market along the waterfront. Wonderful! This was a northwest version. Peg loved it. I would have liked it better with a little pickled ginger in it, but it tasted so fresh and soooooooo Washington! 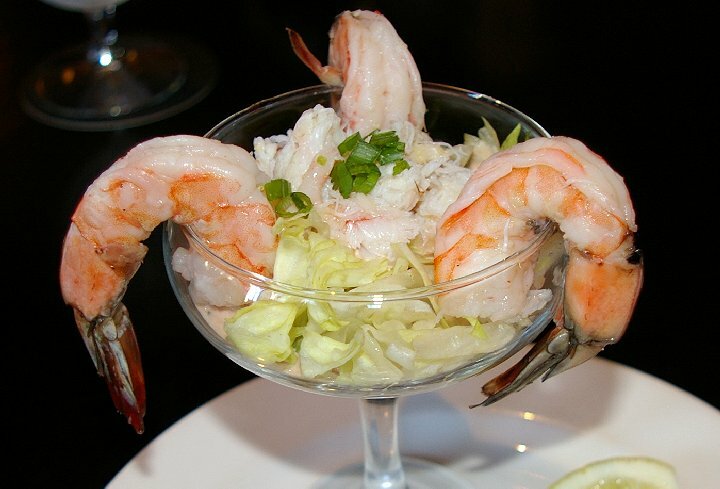 I ordered the Classic Seafood Cocktail with three prawns and Dungeness crab piled on top of a cut lettuce bed. I ordered the Russian dressing with it. I'm used to more spark in Russian dressing, which is basically "Thousand Isand." Russian dressing was created in New Hampshire and has nothing to do with Russia, of course. I like Red Russian dressing, which is like Catalina or French dressing with more tomatoey taste. I should have ordered the standard "classic" with seafood cocktail sauce. Normally, for my appetizer I would have ordered the cold-smoked columbia river steelhead, with crackers, red onion, capers and cream cheese. I was sampling different things, however. 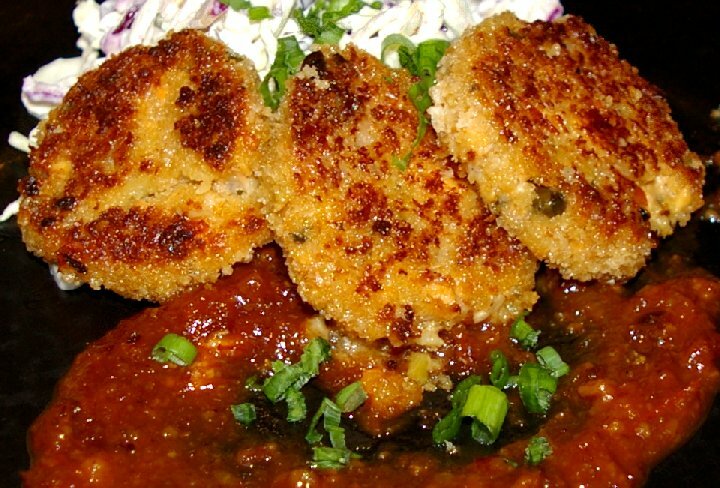 Kate loves the salmon cakes as an appetizer. In New York they serve Atlantic "farm raised" Salmon and people back there are happy with it. Kate knows the difference and loves salmon from the Pacific Northwest . . . and especially from Pacific Grill. For dinner Peg ordered the scallops. 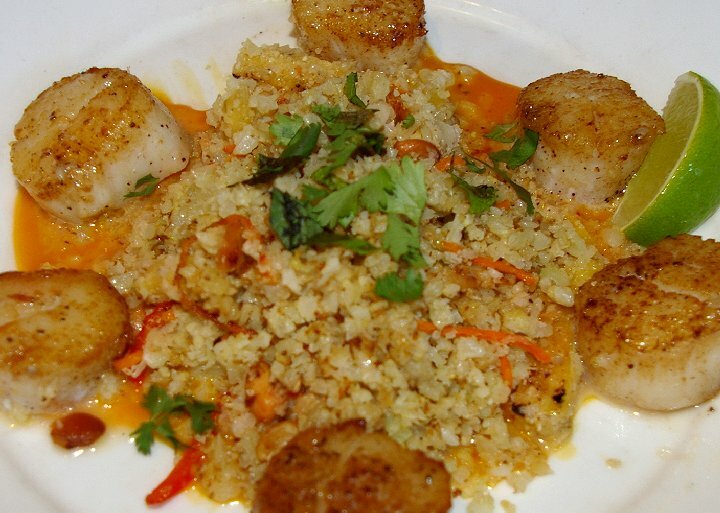 The were sautéed day boat scallops (roughly the size of silver dollars) with cauliflower ‘rice’ and grilled pineapple, vegetables, cashews, trinity herbs plus passionfruit-fresno chili sauce. She almost always has the scallops. 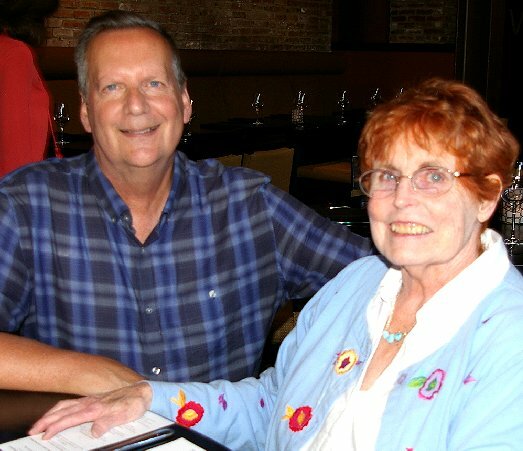 I had the ribs from the new menu and so did Peg's sister Pat. 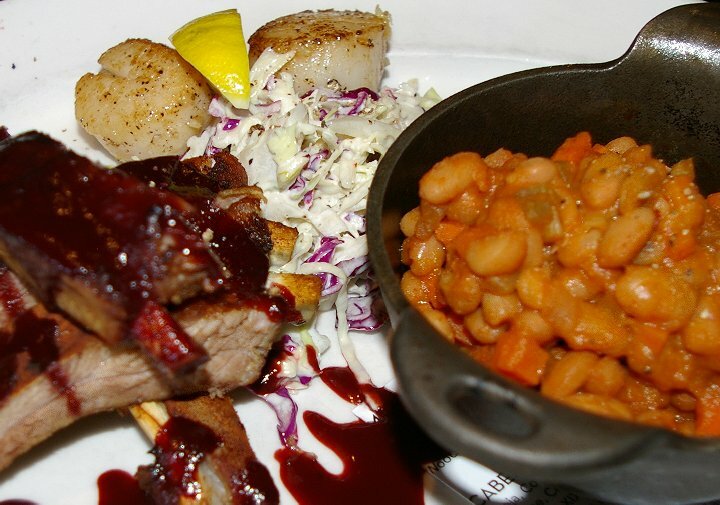 I also had a small order of scallops (2) with my cherry-lacquered baby back ribs, cider baked beans and coleslaw. Both Pat and I thought the ribs were dry. Peg thinks this is a new preference by diners. I hope not. I'll try it again and ask for more sauce. Half the joy of BBQ ribs is the sauce. My two scallops were perfect, but with a touch of the cherry sauce they went beyond perfect. The baked beans were an interesting surprize. Cooked al-dente they featured little cubes of crunchy carrots and onions. If those beans were available at a backyard picnic I would elbow people aside to get several helpings. 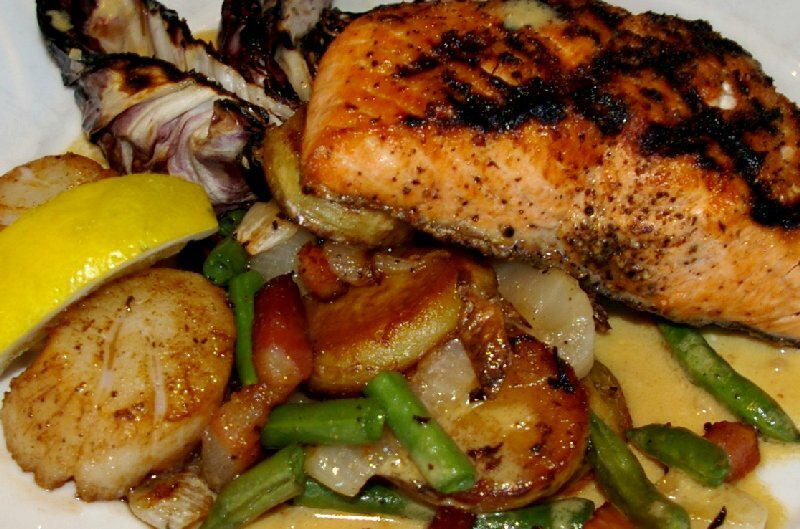 Marie's husband is a chef in the Lynnwood area. 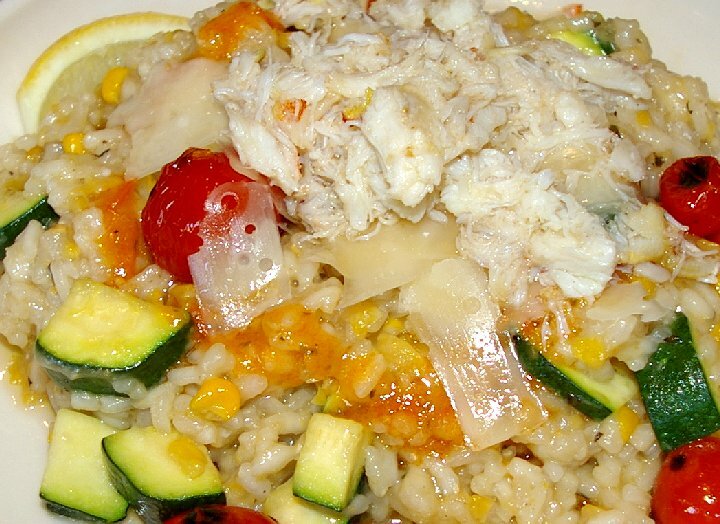 She chose the sweet corn risotto with marjoram, zucchini, and blistered cherry tomatoes topped with crab. She took left-overs home for hubby to sample. I thought she was going to do that with her dessert as well, but she finished that all by herself. In addition to her salmon cake appetizers, Kate chose the fresh grilled wild king salmon with crispy yukon gold potatoes (she loved those), green beans, grilled radicchio (Peg enjoyed a taste), and walla walla sweet onions along with Nueske’s applewood-smoked bacon and dijon mustard vinaigrette. For dessert, Pat chose the cookie selection. 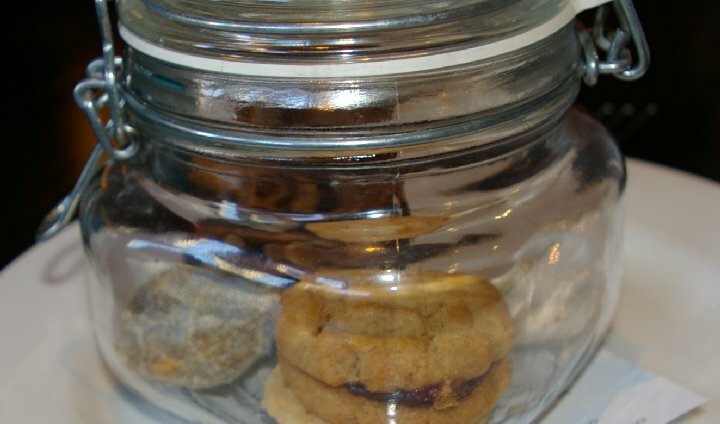 When it was delivered, she asked if she got to keep the cute little glass jar they came in. The waiter replied, "No, that's to keep me from eating them while I'm delivering them." Great line. 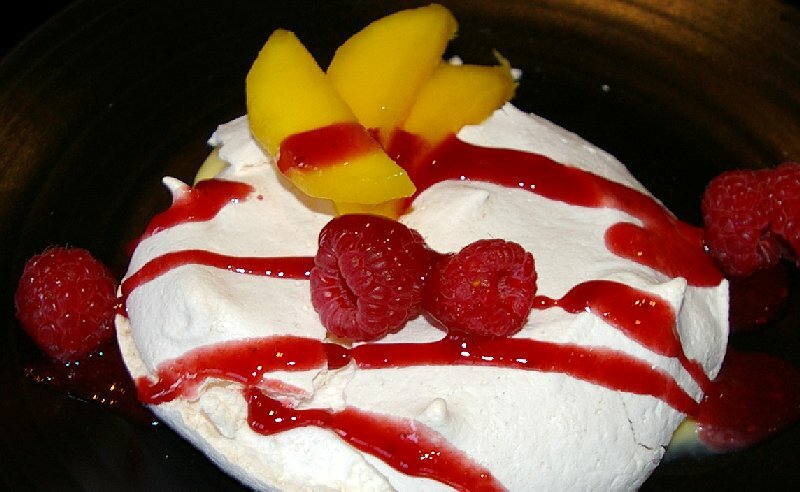 I was disapointed that the tart Peg and I had shared a couple of weeks earlier was no longer on the menu, but the Raspberry Mango Pavlova soon healed all wounds. 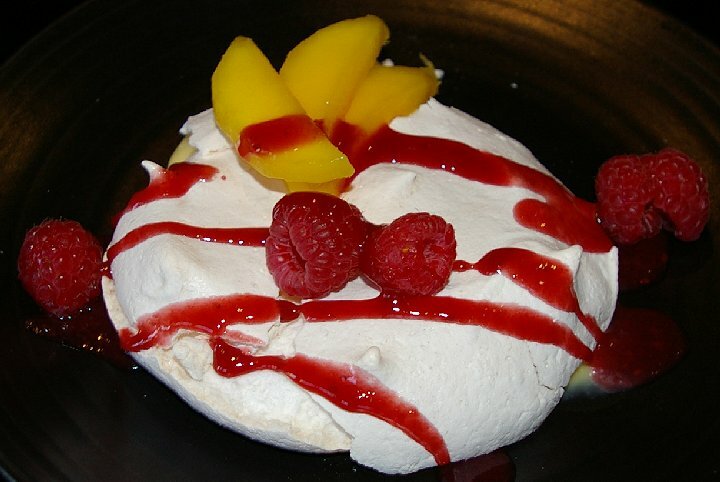 The ginger meringue with mango curd, fresh raspberries over a mango and raspberry coulis assuaged my loss. Marie had the same dessert and loved it. 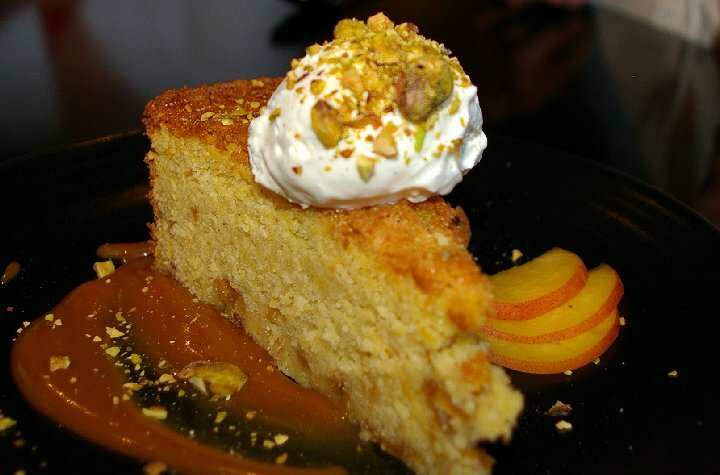 Kate and Peg had the Peach Cornmeal Cake. Fresh peaches, whipped vanilla bean crème fraîche, toasted pistachio and caramel sauce added the right texture and taste to elevate cornmeal to a confection delight. As Peg went on and one about the cake, I secretly motioned for Diane to come over the to table. I whispersed, "I think Peg needs one more order of that cake to go." After our fantastic meal we went back home. I opted for an early bedtime, while the women laughed and told stories of times past in our living room. Somehow, the conversation kept coming back to dinner . . .
Pacific Grill Summer Menu - Restaurant Review - Tacoma - 2017, Pacific Grill Restaurant Tacoma, Fine dining restauran Tacoma, Pacific Grill Summer Menu - Restaurant Review - Tacoma - 2017 Washington WA.